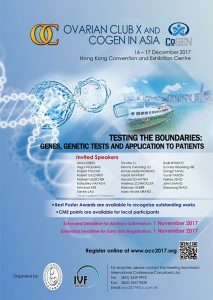 Ovarian Club X and CoGEN in Asia will be held on 16 – 17 December 2017 at Hong Kong Convention and Exhibition Centre in Hong Kong. Both Ovarian Club and CoGEN specially focus on themed scientific meetings instead of general programs and we present in-depth discussion concentrating on the science and how they can be applied to the clinical practice of Reproductive Medicine. 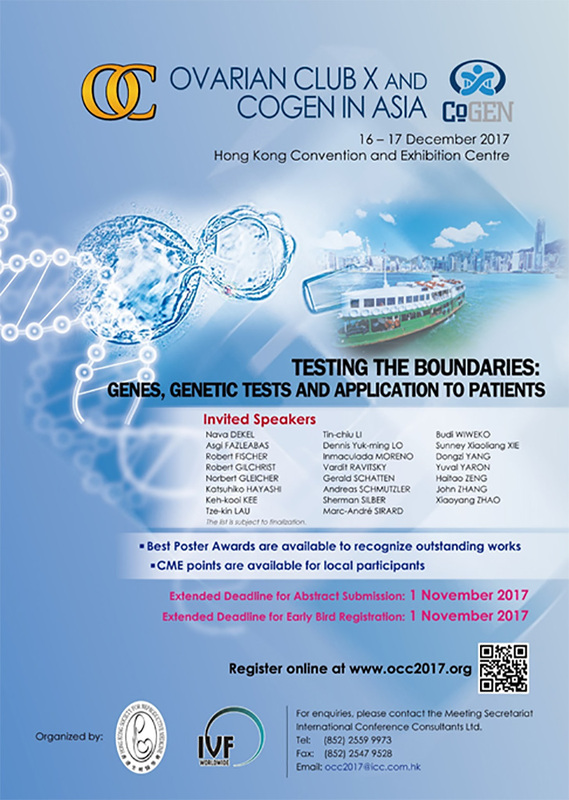 This first action in Asia is an attempt to combine both meetings, with the theme “Testing the Boundaries: Genes, Genetic Tests and Application to Patients”. Please click here for more registration information and register online. CME points are available for local participants. Should you need more information, please contact the Meeting Secretariat at (852) 2559 9973 or via email to occ2017@icc.com.hk.